The date on Sunday will be November 22. That’s a date which will forever be ingrained in the minds for anyone who was around on that day in 1963. That was the day that President John F. Kennedy was assassinated in Dallas on a sunny Friday afternoon. Sunday will be the 52nd anniversary of that tragic event. I can remember precisely where I was when President Kennedy was assassinated on that dark day in American history. I was in the first grade at Corpus Christi grade school in Milwaukee, Wisconsin. Our teacher sent us all home after lunch after the word came out that Kennedy had indeed been assassinated. I remember huddling around the television that day and entire weekend with my family as events unfolded. Like so many, I saw Lee Harvey Oswald get shot by Jack Ruby on national television on Sunday morning, November 24. Even though the President had been assassinated, NFL commissioner Pete Rozelle made the worst decision he ever made running the league and he always regretted it. Rozelle decided that all NFL games would be played that Sunday. That decision did not sit well with head coach Vince Lombardi of the Green Bay Packers. In one of my many conversations with Jerry Kramer, the legendary right guard of the Packers recounted that situation. “I remember coming out of the locker room when I heard the news that the President was shot,” Kramer said. “I had a sinking feeling down in my gut. I admired him and thought he was a wonderful President. He was cool, classy, bright and just had a lot of things going for him. Lombardi had become friends with Kennedy over the years and was a supporter of his in the 1960 Presidential election. Kennedy had always been a football fan his entire life and the Packers were the dominant team in the NFL during his short Presidency. 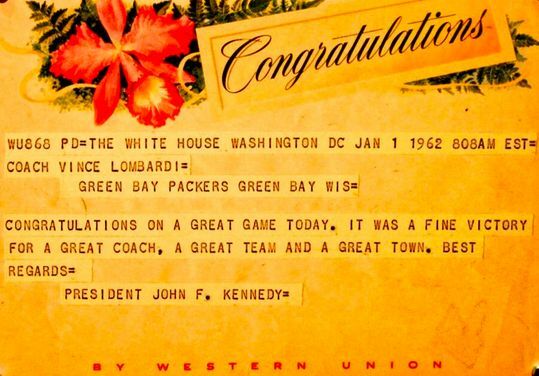 Kennedy sent a nice telegram to Lombardi and the Packers after they won the 1961 NFL title as a matter of fact. That dominance began when the Packers won their first NFL title under Lombardi in 1961. Green Bay had come close to winning it all in 1960, but in the NFL Championship Game at Franklin Field in Philadelphia, the Packers narrowly fell to the Eagles 17-13, even though the Pack had dominated the game statistically. The game ended when fullback Jim Taylor was tackled on the 10-yard line of the Eagles after snaring a pass from quarterback Bart Starr. But Green Bay was ripe for a NFL title in 1961 and the Packers and the community knew it. After losing to the Detroit Lions on the opening weekend of the season 17-13, the Packers rolled to six straight dominating wins. Then something happened in October. Because of the increased escalation of the Cold War and the building of the wall in Berlin by the Soviets, the Department of Defense had activated thousands of military reservists and national guardsmen for duty. That activation included a couple dozen players from the NFL, and three very important players from the Packers. 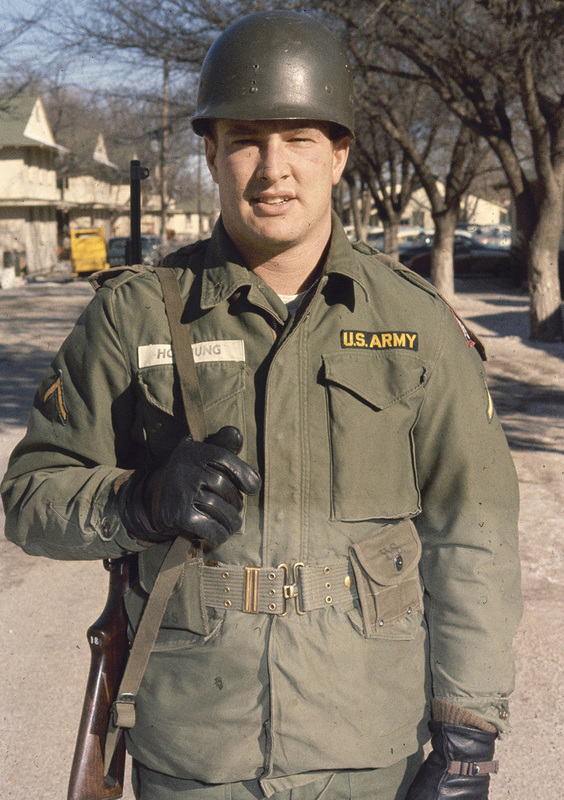 The players were Paul Hornung, Ray Nitschke and Boyd Dowler. As noted in David Maraniss’ book When Pride Still Mattered, Lombardi was very upset by this situation. Lombardi thought that the Packers were hit harder than anyone in the NFL because of the scenario. It would be one thing to miss a game or two in the regular season if one couldn’t get a weekend pass, but it would be very critical to the Packers chances of winning had anyone of the three Packers missed the NFL championship game, especially Hornung. This is when the relationship between Lombardi and Kennedy helped make Hornung available for the title game. Initially, Hornung was not granted access to go back to the Packers for the championship game. That would have been a HUGE blow as No. 5 was the NFL MVP in 1961. Lombardi was obviously concerned about that situation, so he placed a call to JFK to see if the President would get Hornung a pass to join the team for the big game. Sure enough, the former Heisman Trophy winner from Notre Dame was given a pass to play in the game. “Paul Hornung isn’t going to win the war on Sunday, but the football fans of this country deserve the two best teams on the field that day,” Kennedy told Lombardi a few days before the championship game against the Giants. The Packers battered the Giants 37-0 in that game, and Hornung scored 19 points in that game just by himself. Titletown was born that year. That was also the first year a title game was ever played in Green Bay. Lombardi and his Packers brought four more NFL championships to Green Bay (including two more championship games in Green Bay), as well as the first two Super Bowl wins. But 1961 was the start of it all. And the alliance of Kennedy and Lombardi played a big part in making the name Titletown stick. 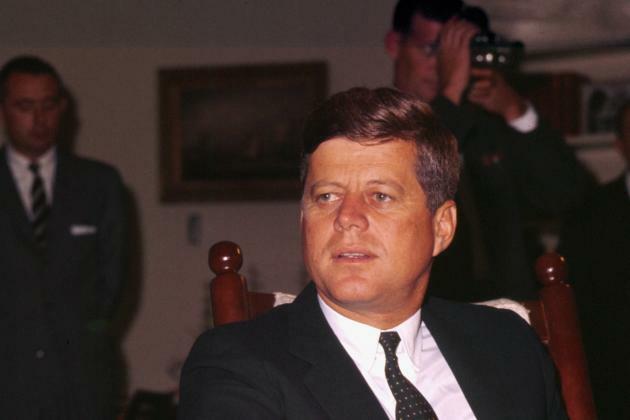 This week marks the 48-year anniversary of John F. Kennedy’s assassination in Dallas, and for those who were alive on Nov. 22, 1963, the death of our 35th president marked an unforgettable time of darkness. Football was far from anyone’s mind, but NFL games went on as scheduled that weekend amid a cloud of loss and confusion. Certainly no team endured stranger circumstances than the Cowboys, who traveled to Cleveland for a game that NFL.com’s Gil Brandt still remembers in detail. The city of Dallas found itself under a microscope, resented by many for Kennedy’s death, placing Cowboys players on high alert. Landry fought to keep his players focused, even while fresh drama unfolded out of Dallas. On Sunday morning, the nation watched as nightclub owner Jack Ruby shot and killed Lee Harvey Oswald on live television while the suspected assassin was being transferred from city to county jail. Relive every game this season online and on-demand with enhanced viewing features, including the “All-22” coaches film. Get NFL Game Rewind. “When we were in the locker room, right before the game, Tom Landry was at the chalkboard when a security guard busted in and said, ‘They just killed the man who killed Kennedy,’ ” Brandt recounted. “Landry paused for a moment and said, ‘Thank you,’ then went about his business. The mood that Sunday at Cleveland Municipal Stadium was unfriendly, to say the least. Excellent historical insight there, Joseph. Great job!